The churches of St Columba (1902) and St John the Evangelist (1865) are two of the remaining Anglican churches in the town center of Middlesbrough in the Archdeaconary of Cleveland and within the Diocese of York. St Columba once served a residential area of some 28,000 people in the Canon Park area. Today there are less than a thousand residents within the parish boundary. It formally stood on the old Boundary Road, now it sits adjacent to Sainsbury’s Supermarket. St John’s is situated at the other side of the town – at the corner of Marton Road and North Ormesby Road. When approached from the boulevard at the side of the Town Hall, St John’s stands out as an imposing and magnificent building – near a cinema and other leisure amenities in what has now become the St John’s Gate area of the town. Around 30% of the population of the Parish is now made up of ethnic minorities. 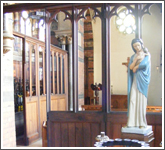 Both churches stand within the modern Catholic tradition of the Church of England – each seeking to offer dignified worship in their own unique setting. Each church has also passed resolutions A, B and C.
We hope you enjoy visiting our website – to discover a little more about our history and our current activities. You would also be very welcome at any of our advertised services, as would any enquiries regarding weddings and baptisms. 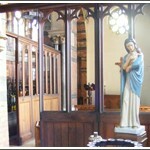 Developed by Daniel Jones | © Copyright: The Parish of St. Columba with St. John the Evangelist, Middlesbrough, 2010.